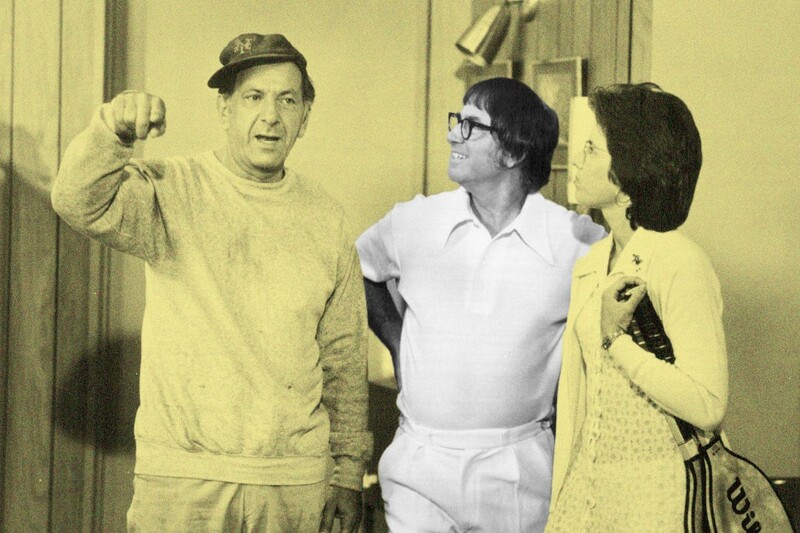 Was Bobby Riggs a Sexist? An Opportunist? Or Just Misunderstood? Battle of the Sexes opens today, telling the story of how the infamous 1973 tennis match between Billie Jean King and Bobby Riggs came about. Riggs, who died in 1995 at the age of 77, was known to be a showman, a gambler and a chauvinist, constantly arguing that the women’s game was inferior to the men’s. The film, which stars Emma Stone as King and the very likeable Steve Carell as Riggs, tries to suggest that the former Wimbledon champion’s bluster was mostly a lot of hot air: He wasn’t a misogynist so much as an opportunist who was able to tap into a patriarchy’s anger at the rising women’s liberation movement. The Riggs we meet in Battle of the Sexes is less a sexist than a sad sack who played the role of a chauvinist to promote a tennis match and, in the process, propel a 55-year-old has-been back into the limelight. But how accurate is that depiction? Was he really swine—or just a great self-promoter? Two books dig deep into Riggs’ mindset — one a biography, the other Riggs’ own memoir. They both leave you feeling that Battle of the Sexes isn’t far off in its argument that Riggs wasn’t really a misogynist. But you don’t walk away from them thinking that he’s some misunderstood hero, either. “Oh, anybody ranked about a hundred could beat the women’s champion. … Hell, I could beat Billie Jean!” Riggs responded. According to LeCompte, it was then that Riggs decided to set the so-called “Battle of the Sexes” match in motion. Court Hustler meant to capitalize on Riggs’ return to the public eye after years away from tennis, recounting how he’d defeated women’s champ Margaret Court in May 1973 — his showdown with King would take place that September — while looking back at his career and offering opinions on the sport in general. LeCompte’s 2003 overview is far more surgical and less celebratory, trying to analyze Riggs’ childhood to find clues to his later behavior. Riggs’s coarse, chip-on-his-shoulder demeanor is crucial to understanding the man who went on to challenge King. After he walked away from the sport to focus on golf in the 1950s — he returned to play on the seniors’ tour in the late 1960s — Riggs was frustrated that he could never recapture the public’s imagination as he did in his youth. And when he got back into tennis, he was infuriated that the seniors made less than female tennis players did. A Kirkus review at the time declared Court Hustler “[a]n inspiration for all men who long ago gave up fighting onsetting potgut and the old lady,” but those who bought the memoir in the hopes of reading more of Riggs’ belittling sexist commentary would be disappointed. At lot of it does seem like an act. In fact, Riggs is actually pretty complimentary of the women’s game, even commending King and others who helped form the Virginia Slims female pro circuit in the early 1970s because they weren’t getting paid as much as their male colleagues and wanted more financial control. He also comes across as pretty progressive, speaking out about the need for more diversity in tennis. In Court Hustler, he declares, “The time is overdue for the arrival of many fine black players on the tennis scene,” spotlighting Arthur Ashe as not just a terrific athlete but also a passionate advocate for ending apartheid in South Africa. And although Riggs includes several cringe-y, antiquated uses of the word “ghetto” in Court Hustler, it’s clear he understands the economic and social factors that have held back African-American kids — and why athletes of color are important symbols for those of meager means. “[B]lack youngsters can dream of becoming an Arthur Ashe as they once yearned to be a Willie Mays or a Wilt Chamberlain,” Riggs writes admiringly. It wasn’t the first time Riggs was dead wrong.